Artists in Mexico City have been known to get political, figuratively inviting bureaucracy into their studios—and sometimes literally. In the 1930s, Diego Rivera and Frida Kahlo arranged for Leon Trotsky’s political asylum in Mexico, and he lived with the artist couple for several years at their home in Coyoacán. The Soviet communist leader later moved into Caza Azul, Kahlo’s family home, for years that included an assassination attempt by a fellow Mexican painter, and, eventually, a gravesite designed by Rivera’s friend Juan O’Gorman. While today’s contemporary art scene may not tempt political intrigue so explicitly, Mexico City’s art scene is still known for artists, galleries, and institutions actively engaged in politics. During the city’s Zona Maco art fair in February, current events were front and center. It was, after all, months after the most contentious U.S. election in history, and the artist community was primed to tackle every headline, executive order, and tweet. 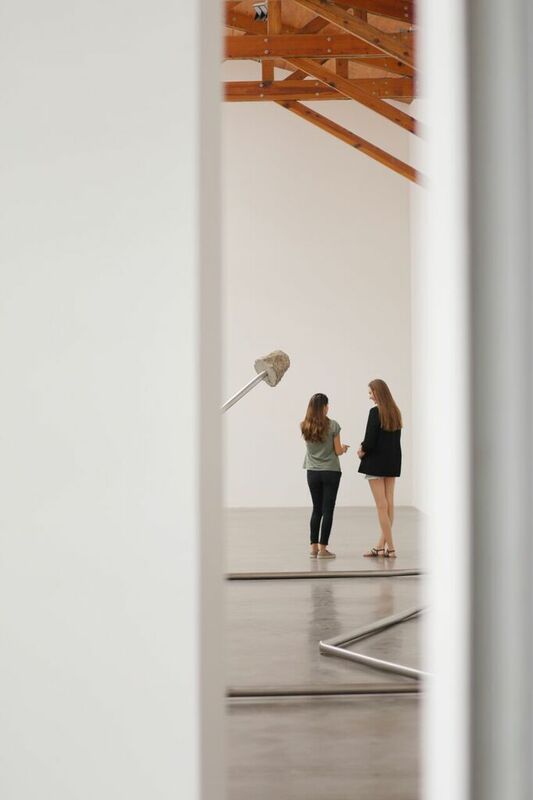 The past decade has brought a major art boom to D.F., with new spaces like Museo Jumex, the retrofitted El Chopo, and plenty of galleries opening, as well as major contemporary artists from the generation that emerged out of the 1990s, like Pedro Reyes and Yoshua Okon, making it their home. “Mexico is a country historically of amazing painters–and now of art that cannot be outsourced,” Reyes said during the week of the fair, when he hosted a party for artists, curators, and gallerists at his home, not far from Caza Azul. The 14th edition of Zona Maco was especially representative of the moment, as a surge of sharp, measured critiques of the current policies between the U.S. and Mexico arose in work all over the convention hall. And it didn’t go unnoticed; the ever-growing fair now attracts more than 50,000 visitors a year and more than 120 galleries from the world over. 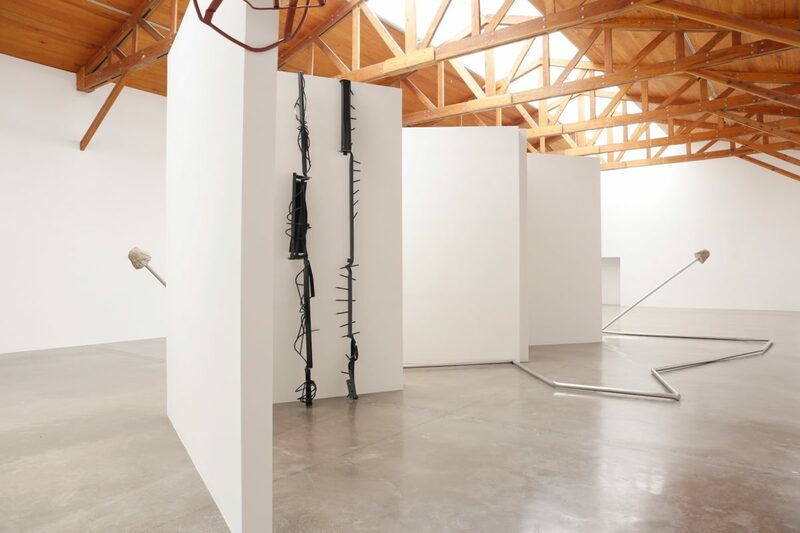 Artistic director Daniel Mirza commented on the political mood among Mexico’s galleries. “It’s what’s happening. But there’s tons of American galleries who are our friends. There’s a great disposition between institutions from both countries,” he said, noting a collaboration at the fair with the Getty’s upcoming Pacific Standard Time: LA/LA focused on Latin America – which will feature exhibitions like Radical Women at the Hammer, a survey of work made in the 60s through 80s by artists like Lourdes Grobet and Isabel Castro. “We don’t represent our governments,” he added. 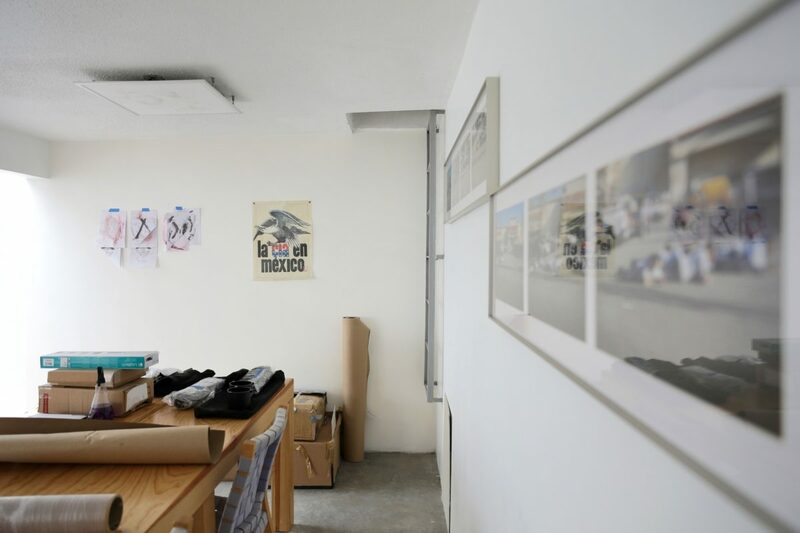 Kurimanzutto, a major gallery in the city, showed artist Rirkrit Tiravanija, who speared Trump-era policies as well as Mexican president Enrique Peña Nieto with a wall-size installation using current news clippings detailing the scandals and criticisms surrounding both leaders. Parque Galeria showed local artist Yoshua Okón’s sculptural pieces inspired by the George H.W. Bush-led CIA interventions into Latin America. 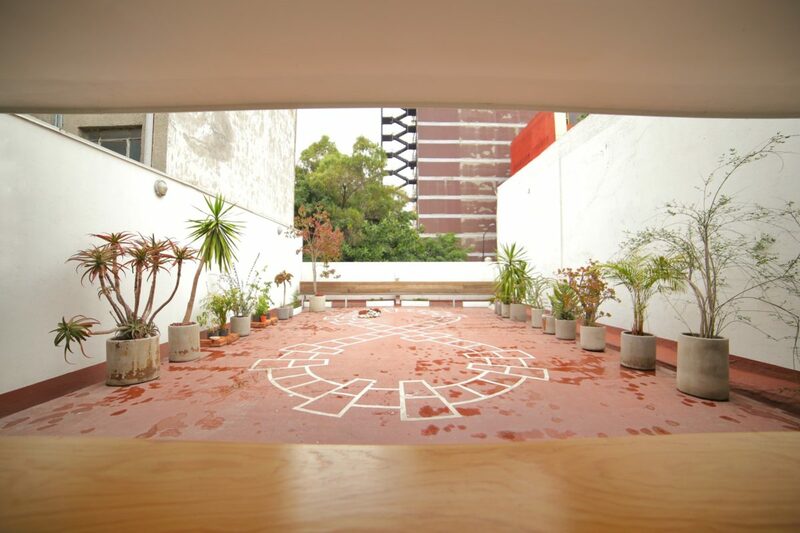 Okón, with Miguel Calderón, used to run La Panadería, a 1990s artist-run DIY space, and now helms SOMA Mexico, an artist-run academic institution. Roaming the aisles of the fair made for a telling litmus test – while gallerists at other art fairs tend to shy away from controversial work that might hurt sales, local Mexico City dealers highlighted the issues overtly. And it wasn’t hard to overhear a political jab from mingling fairgoers. “I think America deserves him,” said one. “It’s a wakeup call,” said another. Mexico is everywhere. Mexico isn’t contained by a border. It’s an idea. 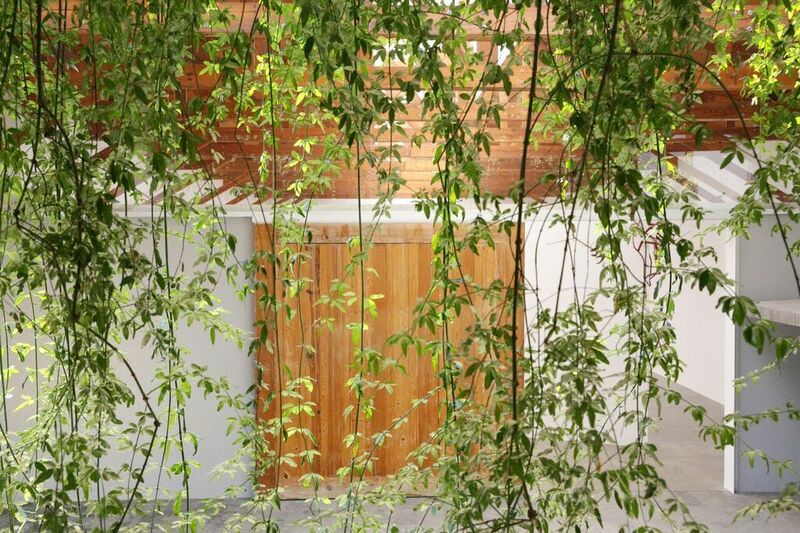 Arredondo\Arozarena, founded in 2010 by husband and wife team Georgina Arozarena and Andres Arredondo, shows high-minded, cerebral work by Mexican artists and international artists working in Mexico. 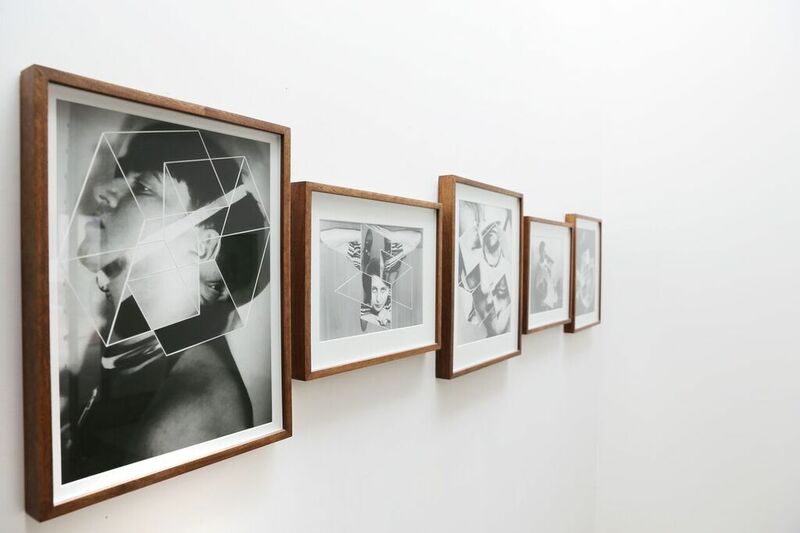 The gallery features highly experimental and thought-provoking exhibitions that go beyond the gallery walls. Their Proyecto Vitrina invites artists into a public space on Praga Street near Plaza Juarez; during Zona Maco, they showed an exhibition by Guadalajara-born artist Israel Martínez on the city’s 90s radical punk scene. 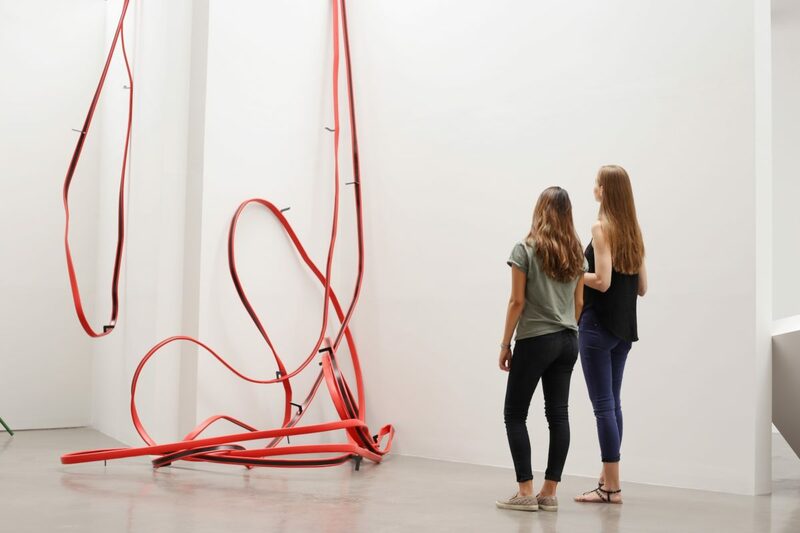 The bold and ever-growing art scene now also supports another event, the Material Art Fair, which started running concurrently with Zona Maco a few years ago. Material co-founder Brett Schultz also co-runs the progressive Yautepec gallery. The DIY vibe of the smaller, more adventurous satellite fair saw local galleries challenging visitors. The city’s Galeria Mascota showed work from Lizzi Bougatsos, part of the #DearIvanka art activist group, which has held protests around New York City (an image of the smiling socialite smacked with awkward braces made the rounds on Instagram). Other spaces like Lulu, Almanaque, LABOR, and Lodos have gained ground in D.F. in recent years, and participated in the fair. 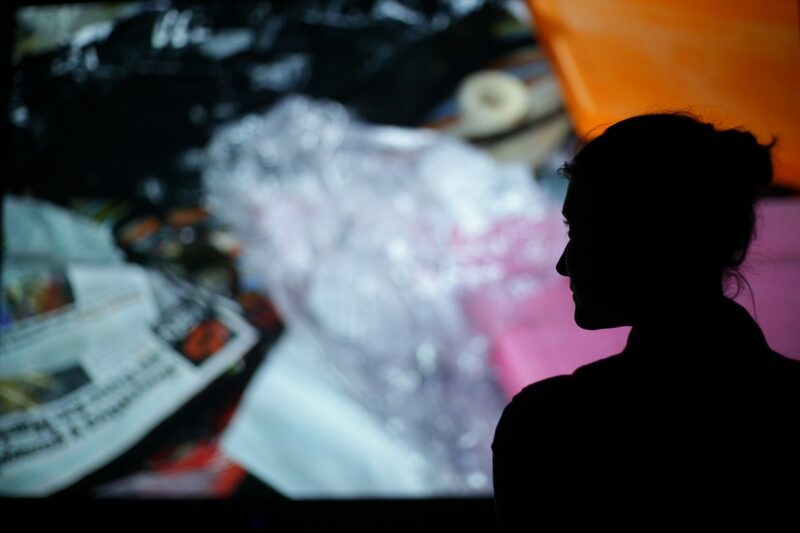 It’s not just young galleries pushing the conversations; institutions in D.F. similarly haven’t shied away from controversy. 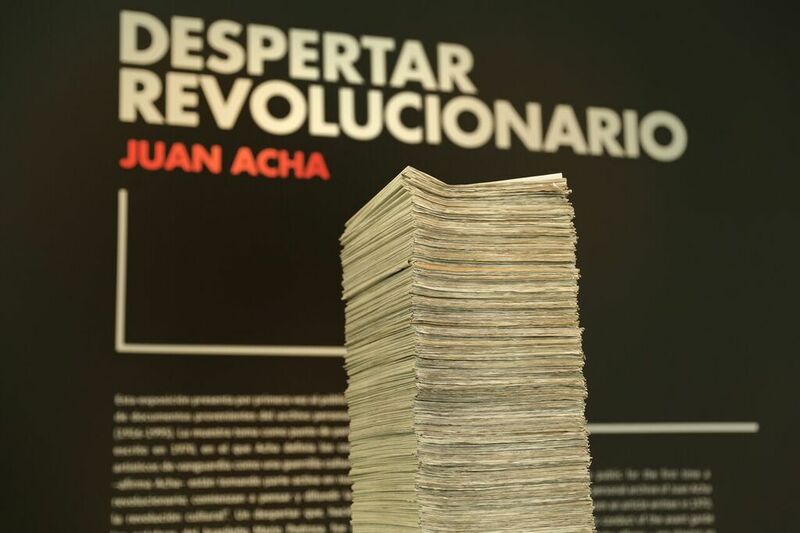 On the same weekend as Zona Maco, Gabriel Garcilazo’s solo show at Museo Universitario del Chopo presented the collateral damage of the drug and arms trade between Latin America and the U.S., particularly over the Mexican border, using the same visual language of codices depicting the arrival of Spanish colonists. 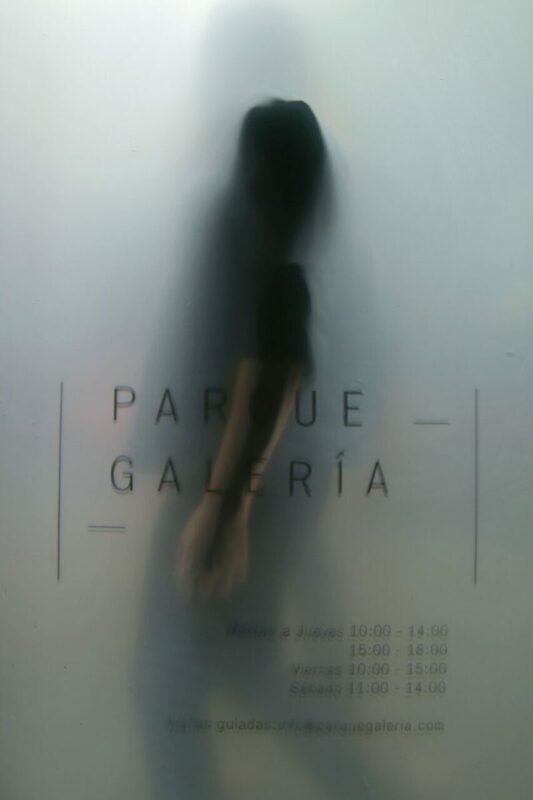 Hours later, the Museo Universitario Arte Contemporáneo, opened in 2008 on the campus of the National Autonomous University of Mexico, opened multiple exhibitions with political allusions abound–the campus itself is a UNESCO World Heritage site, designed by some of Mexico’s foremost architects of the twentieth century. 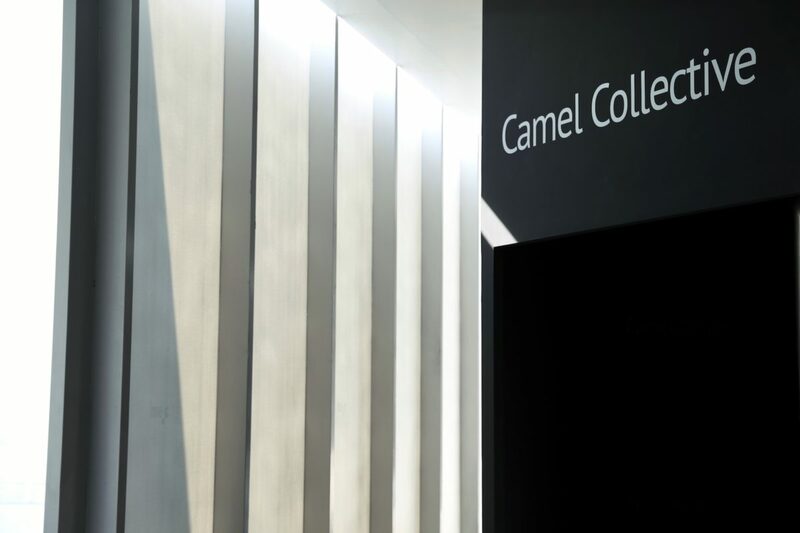 There, Camel Collective, the Mexican-American collaboration between Carla Herrera-Prats and Anthony Graves, presented a video work inspired by conversations between Theodor Adorno and Herbert Marcuse about student movements in the U.S. in 1969. “When we conceived of this project we could not have foreseen the present threats to democracy by rising authoritarianism and populism,” said Graves. It was just a snapshot of the art scene in Mexico, but a potent one for those who want to dive deeper: watch this city for political art that navigates an uncertain future.